Colkirk is located in the northwestern Norfolk within the district of Breckland. It is south of Fakenham northwest of East Dereham. The B1146 Fakenham to East Dereham road and a number of minor roads pass through the parish. The modern Colkirk parish is formed from the three former separate parishes of Colkirk, Oxwick and Pattersley. As a result, it has a rather strange stretched triangular shape. The parish boundary follows roads, a stream, field boundaries and cuts across a number of landscape features. The parish landscape is undulating and varies between 48 and 80m in height. A number of streams originate in the parish, with two flowing south and westwards and two flowing northwards. Colkirk village is the largest settlement within the modern parish and is located in the north centre. Oxwick is in the south centre and is a small hamlet, whilst Pattersley is now no more than a few buildings in the southwest. A number of isolated farms are scattered throughout the rest of the parish. Prehistoric artefacts have been found at sites throughout the parish. Most of the sites are clustered either around Oxwick and Colkirk settlements. The clustering may reflect concentrations of prehistoric activity around river sources, although it is more probably indicative of where metal detecting and fieldwalking has taken place. Having said this, one possible pattern of activity can be identified. All the artefacts found in the parish that can be firmly dated as Mesolithic have been found on the western side of a stream that passes through Oxwick. In 1617 a particular area in the northwest of the parish was called 'Drake North' (NHER 14216). This is an Early Saxon placename, deriving from 'dragon hoard'. As Early Saxon myths talk of barrows containing dragons’ hoards, it is possible that a barrow stood on the site in the Early Saxon period. If so, it may have been Bronze Age or Early Saxon in date. Two undated ring ditches, also possible Bronze Age barrows, have been recorded, one in the southwest of the parish and one in the northeast. Two Iron Age coins have been discovered in the parish. An Iceni coin was collected at a site to the north of Colkirk village, whilst a Trinovantian coin has been recovered from a site to the south of the village. Late Iron Age or Roman terrets and pottery have also come from the southern site. Part of the western parish boundary may follow the line of a Roman road that linked Toftrees Roman settlement (in Dunton parish) to the area around modern Pattersley. Roman artefacts have been found by metal detectorists and during fieldwalking at twenty one sites. A probable settlement (NHER 30867) has been identified in the north of the parish; over 400 Roman coins, numerous brooches, a pin, a finger ring and five bracelets have been discovered at the site. A fair number of pottery sherds, coins and other metal objects have been recovered near Oxwick village and it is possible there may have been a Roman settlement here too. Other Roman finds of particular interest include a possible early 5th century AD coin hoard (NHER 37132) and a dodecahedron shaped copper alloy object (NHER 35839), the purpose of which remains elusive. Close to the possible Bronze Age or Early Saxon barrow the numerous Early Saxon metal artefacts have been found. The quantity and type of artefacts suggest that the site was probably an inhumation cemetery (NHER 30867). Early Saxon artefacts have been discovered in eight other locations, two of which are close to Colkirk village and six of which cluster around Oxwick. The finds from close to Oxwick are of types often found in inhumation cemeteries, although they are not numerous or concentrated enough to suggest the site of a second probable cemetery. Few Middle Saxon artefacts have been reported in the parish. 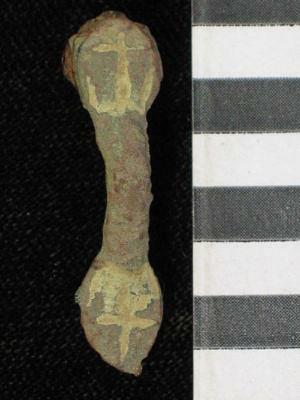 Pins and brooches found at the probable Early Saxon cemetery may suggest that it continued to be used. A Middle Saxon coin was found close to Colkirk village, whilst brooches, hooked tags and a fastener have been collected near Oxwick. Many of the sites with Middle Saxon artefacts have also produced Late Saxon finds. Coins, strap ends and a disc brooch from the site of the probable cemetery suggest activity continued there in some form. In 1086 Colkirk was held by William, Bishop of Thetford and was called ‘Colechira’. This is an Old English or Old Norse placename meaning ‘Koli’s or Cola’s church’. The name may refer St Mary’s Church (NHER 7126), which may have had a Saxon origin (although the present building is medieval and later in date). Medieval finds have been collected in and around the modern Colkirk village. Map and documentary evidence suggests that during the 12th century settlement was focused on the church and a green. During the medieval period settlement expanded and by the 16th century parts of the green had been built on. On the northeastern edge of the village is a group of rectangular enclosures or platforms and several trackways. The enclosures/platforms may well be the site of medieval houses. If so, the northwestern part of Colkirk would have had more buildings than it does today. To the west of Colkirk village, close to Common End, is a medieval moated site (NHER 7122). There is a circular moat, at least two fishponds and the cropmark of a road. The medieval house on the site was abandoned by the mid 16th century. Close by are cropmarks of enclosures and a hollow way, around which medieval pottery has been collected. The Domesday Book lists Oxwick as amongst land held by the Abbot of Ely and calls the settlement ‘Offuic’ (Old English for ‘Ox farm’). All Saints’ (NHER 7127) is a ruined medieval church with later additions, and excavations have revealed that it was once larger than the ruins indicate. It was fully disused by the 1930s. The settlement itself may have been larger in the medieval period than it is now, perhaps extending between the church and a possible medieval moated site (NHER 7182) to the south. The settlement of Pattesley is mentioned in the Domesday Book and other medieval documents. In 1086 it was held by Peter of Valognes and was named ‘Patersleia’, an Old English name meaning ‘Paetti or Paettel’s clearing’. Medieval pottery has been collected from the site of the settlement (NHER 3704), but all that survives above ground is a hollow way. The medieval church of St John the Baptist was abandoned by 1602 at the latest, and fragments of it are incorporated into the 17th or 18th century Pattesley House. Enclosure in Colkirk began in the 15th century and continued through into the late 18th century. The remaining commons (and woodland) were enclosed from the 1850s to 1870s. Post medieval buildings in the parish include Gable End, Hall Farmhouse and barn, Corner Cottage, Starre and a 17th century or earlier house. In the northeast of Colkirk village is a 19th century brick ice house in which a 17th century armour breastplate has been found. 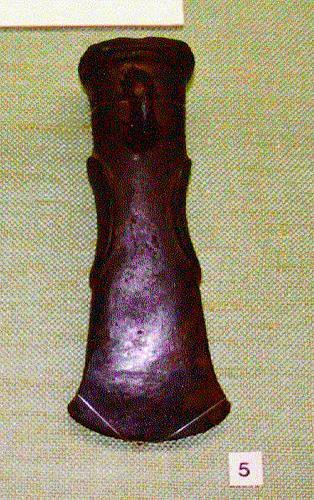 Post medieval artefacts have been found in fields throughout the parish. David Robertson (NLA), 21 October 2005.